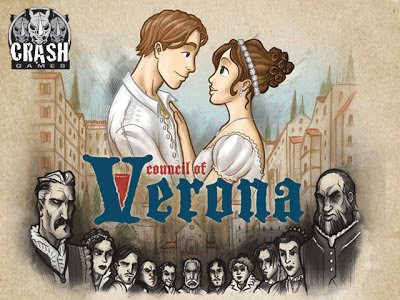 Council of Verona ( CoV ) is a simple card drafting, hand management game. It falls into the vein of Coup and Love Letter in terms of simple gameplay and a small number of cards, but differs from them by virtue of how it plays and the tactics required for the game. CoV plays a fixed number of turns dependent on the number of players. Each turn a player must play a card into 1 of 2 areas ( Exile and Council ). If the played card has an ability, the player may choose to activate the ability if so desired. After which, the player may opt to place a token on an influence card or not. Play then passes to the next player who has the same decisions to be made and when every player has played all the cards in their hand, the game is over and points will be tallied up to determine the winner. Players start with 3 cards ( 4 cards in a 3 player game ) and also 3 tokens of differing values. The players’ cards are drafted at the start of the game. Each player will receive one starting card, the remaining cards are drafted in turn order until the last player receives 2 cards of which he/she will discard one of them facedown. So only he/she knows what card it is and the 2nd last player will have a 50% chance of knowing the same. The way to win the game is by gathering points via the token(s) you have placed on an influence character card. Tokens placed on cards that didn’t meet their victory conditions will be wasted, only tokens on cards that have met the victory condition will be taken into account. Multiple cards may meet their victory conditions, which means all the tokens on the cards will be counted toward the player’s final score. Once each player has played all their cards, the game ends, and the player with the most points is the winner. There are 2 types of cards in the game. Influence Character Cards – Which have 3 areas for the placement of players’ influence tokens. These cards also have a certain victory condition that once met, will score the points indicated on the card plus the points indicated on the player’s token. The abilities on the action cards are mainly abilities that allow you to alter the game state. Swapping tokens or swapping family members from one area to the other for example. In short, I didn’t really quite appreciate CoV. I had gone in hoping to like it at least a little, but it completely fell flat for me. I may have only played it thrice so far, but that’s really more than enough for me. The last player seems to have a certain advantage over the others as he/she is able to influence whether a particular character is able to achieve its victory conditions. Also, the last player will have more options on where to place his/her first token as compared to the first player ( and with more knowledge on the game condition ). With 3 tokens, it becomes obvious that a token must be placed each turn ( in a 4 player game you only get 3 turns ) if you would like to benefit from its value – which is what you want of course because there is no penalty for wasted bids. So if you are the first player, and you play an influence character card with slots for tokens, then that’s where you will have to put your token ( if you want to of course). And so it becomes a blind bid and hope for the best. Which is really silly. And you can’t activate the ability of an action character card either ( if it is your first card played ) as there is no start state for you to manipulate. So really, that’s your first player move right there. Boring. I think the fun part of the game is supposed to come from moving people into the different areas so as to activate their victory conditions. But the back & forth of it just seems rather dull to me. I don’t really feel like I have much control over how they are being moved and influenced. If I wanted more of one family in the Exile for example, I would likely just place a family member of that type there. There is no point in placing it in the Council and try to use an action to swap it later and in so doing, “surprise” the other players. Because you only have 3 or 4 turns, and if you did have a card that allows you to swap, you could just use it to swap a different family member in or out to suit your need. So the decisions aren’t interesting or difficult. There is supposed to be some form of bluffing and deduction is this game. But try as I may, I can’t seem to find where in the world it is incorporated into this game. I do know when and where the bluffing and deduction is supposed to take place – placing your token on an influence card that may not make its conditions hoping someone else might take the bait – but it doesn’t seem to work or matter in the entirety of the game. Too much is decided on the last turn ( sometimes second last turn ) of the game that whatever you do in the early part of the game is kind of fruitless and very unrewarding. I guess I’m pretty harsh on the game considering I have only played it thrice. But in this age of board games where there are so many to try and explore, a poor first impression really doesn’t help a game and makes its journey back to the playing table that much longer and arduous. I do understand that CoV is a short and simple game, but even then, even if I take away any competitiveness in me, and remove the game-mode in me and just sit there and try to appreciate the experience, the experience doesn’t bring me any fun nor laughter.